Here is the final update on these storms. The tornado warning has been extended into Cass Co., MO with reports of a tornado at the moment near Pleasant Hill. 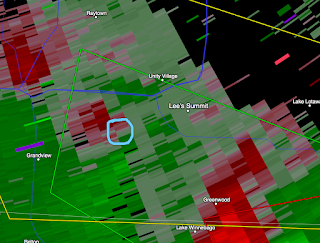 Over KC itself, there is a second storm with some weak rotation (7:58pm) that needs to be watched. This is my last update for the evening. The local KC media is covering the tornado damage and update on the tornado warnings still in effect.